In Colorado and Utah there are numerous dispersed camping areas run by the Forest Service and BLM. These are areas without designated campsites, but have a designated area for camping. Some of the nicer ones have a vault toilet or Port-a-Potty, and a water spigot (seasonal) somewhere in the area. I have never heard of any of these having reservations, just first come-first served until the limit is reached. On-line research will bring up most of these. 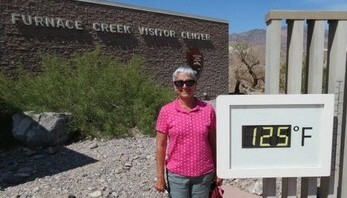 That sounds down right cool compared to Death Valley National Park. Magnolia Beach has boondocking next to the water. Free hot showers. Packed sand makes for solid ground to drive on.